Chris Roberts' ambitious Star Citizen project has set a new record for videogame crowdfunding. Laying to rest any lingering doubts about the potential of crowdfunding, the space sim genre and PC gaming in general, Chris Roberts' Star Citizen managed to squeak past the $6 million mark just before the clock ran out. That figure combines Kickstarter, which pulled in more than $2.1 million, and the Roberts Space Industries standalone funding efforts, which drew in over $4.1 million from joystick jockeys desperate for some zero-G yank-and-bank action. The grand total, barring unforeseen complications, comes to a whopping $6,238,563 from nearly 90,000 supporters. 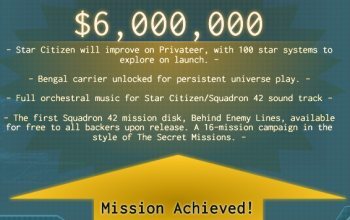 Stretch goals are being applied based on the total funding amount and not just Kickstarter, so the combined $6 million means the game will launch with 100 star systems, a full orchestral score and a free copy of the first Squadron 42 mission disk, Behind Enemy Lines, for all backers. The previous stretch goal, $5.5 million, unlocked the Bengal carrier as a playable ship, added "professional motion capture" to Squadron 42 and earned all contributors a special "Record Breaker" skin and 1000 in-game credits. With the crowdfunding effort now concluded, Roberts Space Industries now sports an "under maintenance" message seeking input from supporters as to what they want to see on the site. "The plan was initially to immediately switch on a wall that would allow only you, our backers, to access features like the Comm-Link and the Spectrum Dispatches," it says. "Kickstarter has thrown something of a wrench in this plan: we can't change the site until the Kickstarter backers are integrated, which may take up to two weeks, otherwise we would be blocking thousands of backers from participating." Space sim fans who didn't get behind the project during the initial crowdfunding phase will still be able to participate, but "it's going to cost you a little extra as of now, and you aren't going to have as many extras," like the lifetime insurance policies on ships that will be given to early backers. It also sounds like RSI will come up with future stretch goals to encourage continued donations. "I am absolutely elated by the incredible outpouring of support for this project," Roberts said. "It's clear that space sim fans have just been waiting for a game like ours to come along and rekindle some of the excitement that's been missing from PC games and the space sim genre. With the resources that our fans have provided, it means the team will be able to provide more features in Star Citizen and deliver an even better game."